1851-1863 [COLLECTIONS] EXTRAORDINARY CLASSIC COLLECTION / ex. Jan Strnad, on 77 exhibit sheets with descriptions in 2 ring folders, contains classic issues Coat of arms 1851-1863, Mi.1-10, AFA 1-10, high specilaization on types, plates, postmarks, plate varieties, as well supplemented with many interesting entires etc. ; with lot of rare and interesting items, i.a. letter from 5.5 1851, selection of plate varieties of Mi.1 (12 sheets), includes rarest 1IIIf chest brown also on letter, Mi.2 - all types 2b (10x), also letter with Mi.2a type 9; mixed franking Mi.3, 4 and 6 on cut-square, letter with Mi.6 etc. ; collection have been compiled almost 50 years, major-part of better items with certificates of Danish experts and specialists, cat. ca. 70.000€, extraordinary offer! 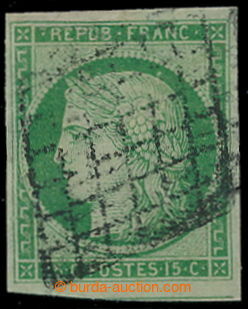 1852 Mi.8a, Napoleon III. 10c REPUB. FRANCE, yellow-brown (light); very nice piece, cat. 700€, rare známka! 1941-1945 [COLLECTIONS] very interesting collection on sheets in 2 screw albums Schaubek, almost complete (except Mi.24-38 and miniature sheet Sturmdivision), contains lot of complete printing sheets (Klb. ), miniature sheets, gutters, opposite facing pairs, coupons etc. ; high catalogue value, according to owner over 5.000€, mainly mint never hinged, it is worth seeing! 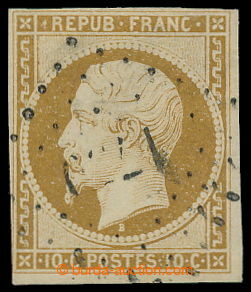 1851 Sass.2e, Lion 1 Soldo "arancio su grigio"; new gum, usual cut to margins, cat. (*) 8.000€ (for * 32.000€), low starting price! 1857 Sass.11, Lion 1 Soldo "ocra" II. wmk; new gum, close but full margins, fine piece, very rare stamp, cat. without gum (*) 21.250€, for hinged with gum * 85.000€! 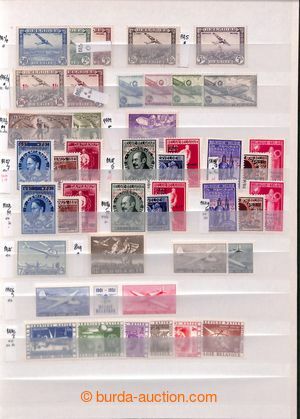 1850-1945 [COLLECTIONS] smaller incomplete collection of Italy in one 8-sheets stockbook, supplemented with stamps of Fiume, Rhodos etc. 1900-1960 [COLLECTIONS] collection of ca. 500 entires, mainly entires from period of 1920-1945, part letters sent as Registered, Ex, many interesting frankings, entires abroad, surtax, lot of various censorships from period of I. and WWII., Field post, Ppc etc. ; various quality, more than 2kg of material, very interesting! 1940-1941 GENERAL GOVERNMENT/ set of 8 mostly Reg letters to Germany and to Bohemia-Moravia, with frankings "Overprint" - Viennese issue", mixed franking with solid stamps, i.a. Mi.26, 27, 28, 37 (cat. 100€); simple franking Mi.32 and others. ; very interesting set! 1799 AUSTRIA/ letter from Pettau from Militar Invaliden Haus-Kommission with very rare decorative red "IMP REG.UFF DI POSTA IN VENICE P TRANSITO", to Torino; half porto 6 Kreuzer; cat. Müller 480P, rare offer! 1850 Ferch.3HIa + 4HIa, Coat of arms 3 Kreuzer + 6 Kreuzer hand-made paper I. types, on cut-square with two DUMB postmarks BIELITZ; so-called. Liliputschnitt, certificate Dr. Ferchenbauer, postmark according to cat. Müller total 5.100 points (Müller. nr. 218c); ex. E. Capellaro, very rare! 1850 Ferch.4HI, Coat of arms 6 Kreuzer, hand-made paper type I brown, with two BLUE postmarks RECCOMANDIRT; great example, very fine color, cat. Müller 1.500 points (Nr.3720), ex. E. Capellaro! 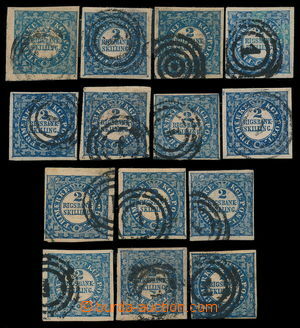 1850 Ferch.4HI, Coat of arms 6 Kreuzer, hand-made paper type I on cut-square with blue (müller - blau) cancel. POHRLITZ RECOMMANDIRT; perfect quality, cat. Müller 1.275 points (in black color 840 points); extremely rare postmark, important rarity, ex. E. Capellaro!